SINNERS AND SAINTS Ethan Hawke plays a dour pastor who oversees a 250-year-old church and a wayward flock. The impassioned qualities Paul Schrader brings to First Reformed are exactly what one hopes for in a religion: it's compelling even when you don't believe it. 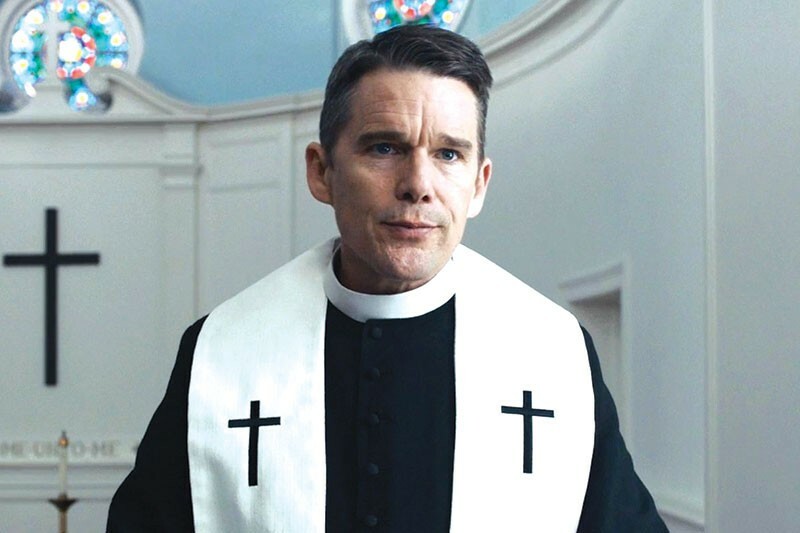 Ernst Toller (Ethan Hawke) is a solitary pastor, a devotee of Kierkegaard and Thomas Merton in a working-class upstate New York wowed by charismatic churches. Toller leads the steepled, 250-year-old First Reformed church in Albany. It's a bone thrown at him by Jeffers, the well-fed pastor of the Abundant Life megachurch (Cedric Kyles, aka Cedric the Entertainer). Toller's pregnant parishioner Mary (Amanda Seyfried) approaches the pastor about her troubled husband, Michael (Philip Ettinger), tormented about bringing a baby into a world doomed by climate change. Mary finds evidence that Michael plans a terrorist act. His likely target: a billionaire climate-change denier (Michael Gaston), modeled after one of the Koch brothers, who is a major donor to Abundant Life and First Reformed. Torn by his own uncertainty, and convinced by Michael's ecological activism, Toller wonders if he should make a martyr of himself. Seyfried is the sun in this wintry movie, warming it up; her long blonde hair falls like a curtain in front of the camera. And Hawke is very convincing as a wifeless, childless divine whose devotion to duty has almost destroyed him. If Toller is the type of Protestant scold who advertises his next sermon as "Will God Forgive Us?" he shows compassion when a class of visiting kids tour the holiest place in the church. It's the trapdoor concealed under a pew, a leftover from when First Reformed was a stop on the Underground Railroad. Toller's eagerness to make the kids understand is very touching. Every now and again, one glimpses Hawke measuring the effect of his own acting. And sometimes Schrader seems to turn Toller into his most famous character, Travis Bickle of Taxi Driver. Toller is part of Schrader's career-long obsession with fanatics, and the director's continuing question of how deeply into the woods one can follow a madman. 'First Reformed' is playing at Rialto Cinemas, 6868 McKinley St., Sebastopol,. 707.525.4840.